Today I have a special "treat" for stopping by! 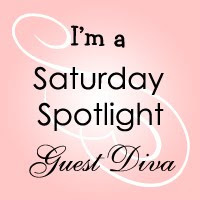 Have you heard of the Saturday Spotlight with Hidden Potential? 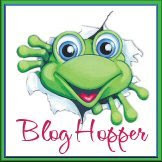 We would like to welcome you to our Saturday Spotlight Hidden Potential Challenge Blog where there will be a fun challenge for you to try out EVERY Saturday! To join in the fun, please post your project on your blog with a link to our challenge, then leave us a comment with a direct link to your creation so we can check it out!! If you don't have a blog, you can always post your project to an online gallery (please use keywords: SSHP01, etc.) We want everyone to be able to participate, all are welcome! ALL styles of artwork are welcome and combining challenges with our challenges are welcome. Please feel free to use any media/companies you like to work with! (We just ask that you create something NEW for each challenge.) We all feel that everyone has something to share and we can all learn from each other! Being different can be a good thing! 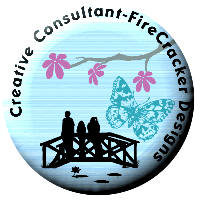 Vicki contacted me right before I went on vacation and asked me to whip up some treat things so I agreed especially since FireCracker Designs by Pamela is sponsoring this week! I made the topper piece by using my Slice and cutting the shape at the largest 4" size. I then folded it in half. The topper is 4 inches long but the width is not so it fits just right on the top of the ATC Sleeve once you fold it in half. I decorated the fronts of two of them by stamping Happy Halloween from FireCracker Designs set Happy Everything in Versamark and then embossing with Copper Dreams EP from Sparkle & Sprinkle. I found the cute moon, ghosts and bats in a drawer they are confetti I think but I thought that adding a few to the topper would be fun too! These two I decided to use the Tumbling Scarecrow set from FireCracker Designs by Pamela on. I stamped, colored and cut out the pumpkins and top half of the scarecrow to mount onto the toppers. Then I used my Fiskars finger knife to cut a slit in the tops and inserted the ribbon loops, adhering with some red line tape so I could hang them if I wanted too - I don't know why it just seemed like the thing to do at the time! LOL! I used my colored staples to attach all the toppers to the ATC Sleeves so they held together. I think if you pop over to Saturday Spotlight to play in the challenge this week that you have a chance to win the Tumbling Scarecrows set AND the Fall Quotes set too! How cool is that! Even better I am going to give my treat bags away too along with some of the ATC sleeves and some toppers that are pre-cut ready for you to decorate. I know too late for Halloween but what about at the Thanksgiving table with a couple after dinner mints? I will draw the winners of my blog candy as soon as I can after that and be sure to post them on my Saturday post next week! Such fun treat containers! The gold embossing on the label really makes these images pop. Congratulations on being a Guest Diva!! 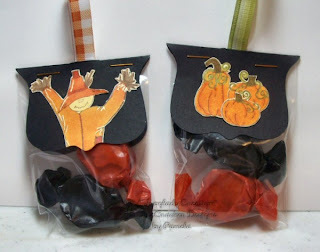 These are such awesome treat bags Karyn!! So fun!! Love the scarecrow and the gold embossing!! COngrats on being on guest diva. You rocked this challenge! These are perfect for the challenge! I love the toppers, the colors are sooooo inviting and the goodies inside. If I was just a wee bit younger (well a whole lot younger) I would definitely be knocking on your door for Halloween!! Great work girl!! These are just adorable treat bags!!!! Karyn these are terrific.. After dinner mints for Thanksgiving would be a great way to decorate your table.. Or give to guests as they leave.. So cute. Those little treat bags are so cute. I have a bunch of atc sleeves too, what a nice idea for a sweet gift. I love the scarecrow too, one of my fave sets. How fun!!! 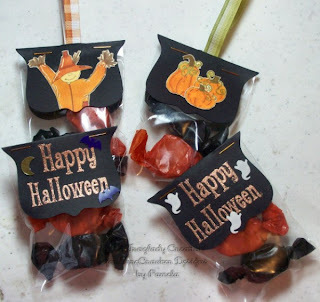 What a fantastic idea to showcase a favorite Halloween treat! Thanks for sharing at Stamp Something! 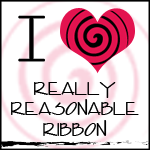 Awesome idea Karyn!! Love these little sweet treats and your packaging is PERFECT! Congrats on being our Guest Diva ... wonderful inspiration!! Your treat holders are so adorable!! So glad you came to design with us this week in The Spotlight!! You do beautiful work!!! 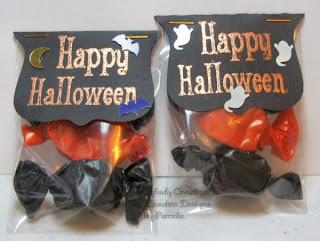 And what a fabby idea to offer some blog candy...fun stuff!!! Wihii, these are gorgeous! Looks fantastic, the stamps are great and I totally NEED to do some of these! those are just so cute. Hi Karyn! Thanks for posting these when you did. I was looking for a project for DS and I to do for Halloween and then you posted these just at the right time! Thanks so much for the inspiration!